In a new image distributed online, the pro-Islamic State propaganda group Wafa’ Media Foundation threatens a massacre in Las Vegas. Masked jihadists carry weapons and the Islamic State flag in the picture’s background, while flaming crosshairs target the Vegas skyline below. Historically, Jizyah was a annual discriminatory tax imposed by states that enforced Islamic law. It charged non-Muslim residents a tax or fee for continuing to practice a non-Islamic faith. Jizyah is no longer enforced today, except in areas controlled by the Taliban and ISIS. The threat of death for “disbelievers” is typical of the Islamic State, and this latest image is obviously intended to rekindle memories of the recent shooting that killed 58 people and injured some 500 more. 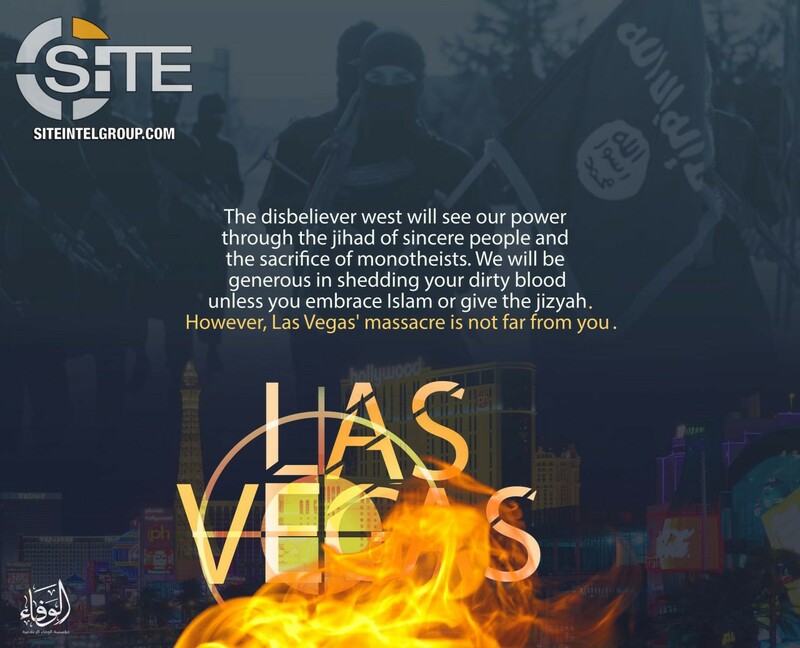 An ISIS-supporting media group threatened another Vegas-style massacre in a new propaganda image, yet zeroed in on a Strip hotel other than the Mandalay Bay. The poster distributed online includes a shadowy backdrop of masked jihadists carrying an ISIS flag, hovering over a photo from the Vegas strip. The words “Las Vegas,” crosshairs and flames are positioned over the Planet Hollywood Resort & Casino. The threat was distributed by the Wafa’ Media Foundation, which released numerous threats during the holiday season. A November poster showed smoke rising from Rome with a fighter jet overhead and a jihadist standing next to the sort of makeshift armored vehicle ISIS uses for suicide bombings in Iraq and Syria. “The date is approaching o worshippers of the cross,” stated the message on the image. ISIS repeatedly took responsibility for the October 1st massacre in Las Vegas, even announcing the name of the shooter as “Abu Abd El Bar.” But no links between 64-year-old Stephen Paddock and the Islamic State have been found. Though ISIS rarely took credit for attacks that weren’t clearly motivated by Islamist beliefs, both the FBI and Las Vegas police have since rejected ISIS’s claim. The group initially sent out a fairly boilerplate statement claiming credit and referring to Paddock as a “soldier” of the caliphate, which is the standard language it uses for attackers. Then ISIS followed up with an uncommon second message, which asserted that Paddock had converted to Islam several months ago. Later in the day, ISIS sent out another statement that identified Paddock by the name “Abu Abd El Bar,” but still offered no supporting evidence for its claim. “Las Vegas’ massacre is not far from you,” the Wafa’ Media Foundation warns.